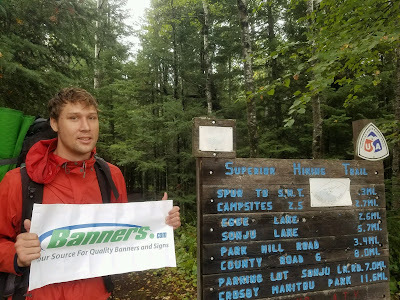 As part of our company initiative to get our employees active, we have started a "Backpacking with Banners" program. Matt and Sabrina recently went on a hiking adventure along the North Shore of Lake Superior. Here are some photos from their adventures. 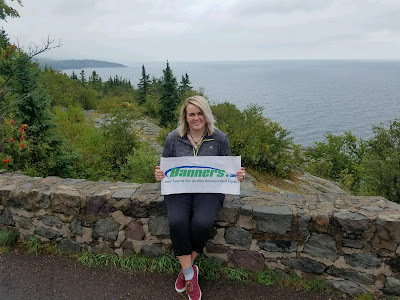 This photo was taken at Palisades Head by Silver Bay, Minnesota after they were hiking. According to Sabrina, there was a lot of rain during their hikes! This photo was taken at the end of the trail head. They had hiked 2.5 miles (in the rain!) to reach the end of the trail.